Google will soon scan the content of your emails and serve up what it thinks is the perfect reply. The new feature, called Smart Reply, identifies Gmail emails that require a response and presents three options for replies. 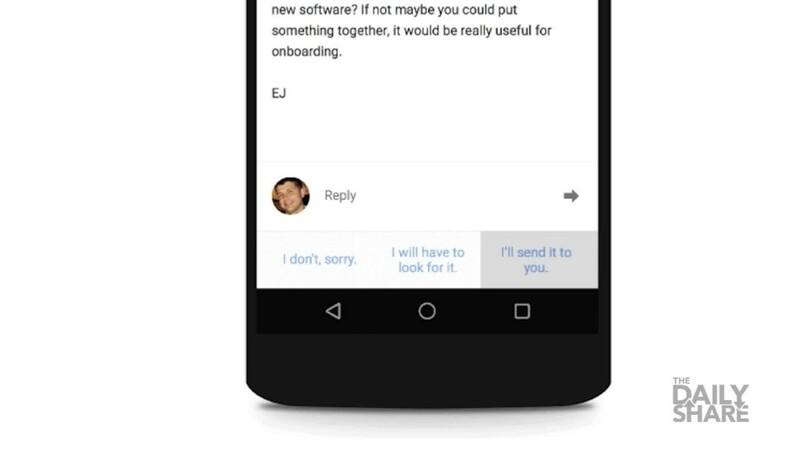 Smart Reply will roll out this week to people using Google's Inbox for Gmail app. "I will have to look for it." "I'll send it to you." In another example, you might get an email that says, "Do you have your vacation plans set yet? When you do, can you send them along?" "I just sent them to you." If you decide to choose a Google-provided response, you can add to it or edit the reply after tapping on one of the three options. Smartphone software makers have been trying to figure out how to save keystrokes for years. Autocorrect, swipe gestures and even emojis are helpful sometimes, but they still require a bunch of taps or swipes to type what you want to say. Quick responses have existed for years, but they're canned messages and don't change based on the content of the text or email that you received. "For those emails that only need a quick response, it can take care of the thinking and save precious time spent typing," said Bálint Miklós, software engineer for the Gmail team, in a blog post. "And for those emails that require a bit more thought, it gives you a jump start so you can respond right away." Miklós said that getting computers to understand how to do that was a difficult task. It takes a great deal of heavy-duty machine learning to pull it off, and it might take some time to perfect it. The responses that Gmail customers choose (or don't choose) will help the Inbox app improve its suggestions in the future, he noted. "For example, when Smart Reply was tested at Google, a common suggestion in the workplace was 'I love you.' Miklós said. "Thanks to Googler feedback, Smart Reply is now SFW :)"